Sturdy wings without any annoying arm straps, that can simply be taken on or off in just a few seconds! 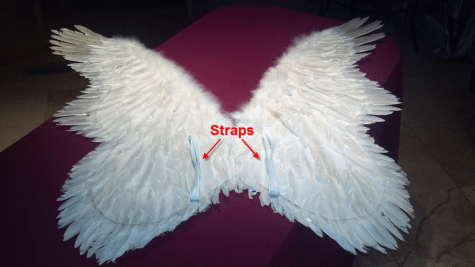 If you’ve ever worn costume wings you’ll know that after a while of wearing them, the straps that wrap around your shoulders to hold the wings up get pretty uncomfortable…AND they don’t make the costume look very realistic. 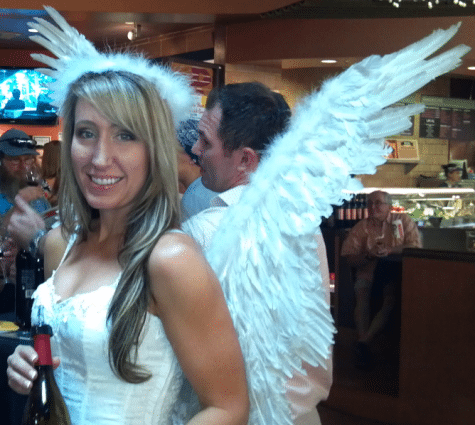 Here are some wings that I wore last year when I was pouring wine at a local winery. I was representing a new ‘angel’ line of wine that had just come out. The wings were BIG and GORGEOUS but would have been really uncomfortable pouring wine for six hours wearing those dreadful arm straps to hold up the wings. Luckily I was one step ahead of the game and altered my costume so that the wings attached directly to the back of my corset. They were easily removable AND in doing this did no damage to my brand-new corset! Double YAY! The wings look SO realistic without the straps and I was able to move my arms around freely! This is how everything looks when the wings are attached. 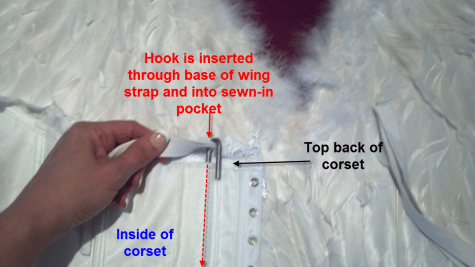 Each hook is inserted through the base of each wing strap (the wing straps are normally used to hold the wings up by wrapping around your shoulders) Then each hook is inserted into each pocket on the inside of the corset. Make your hooks. 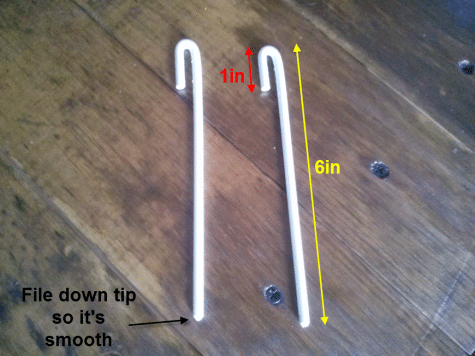 With the 3/16 metal rod, cut two 7in long pieces with a hacksaw. 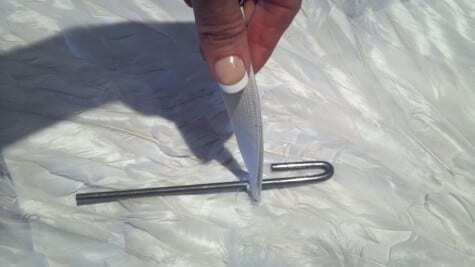 Using your pliers, bend the last inch of each rod back down so it makes a hook, then grind down the bottom tip smooth so it will slide into the pocket easily. I spray painted mine white to match the outfit. 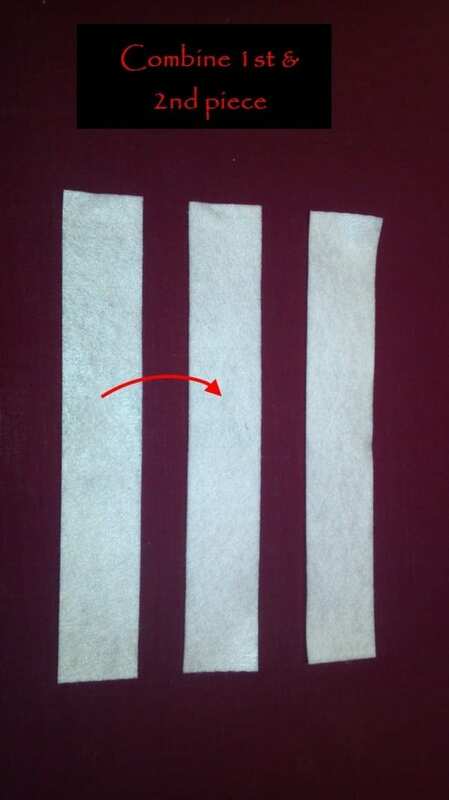 Sew them together, leaving the top open so it makes a pocket. Now make your other pocket following the steps you did for your first one. 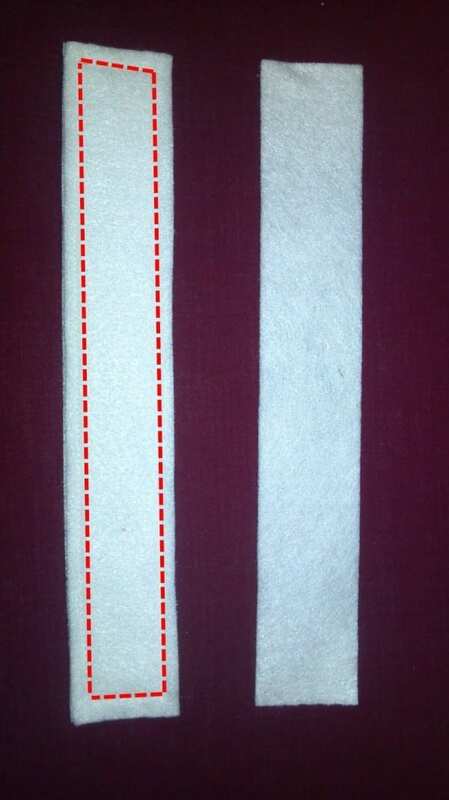 You should have two pockets when you’re done that your hooks can slide into. Take the laces off your corset, and open it up so it’s facing down. You should be looking at the inside of it. Find the marks where the holes you made (in the base of the wing straps) touched the back of the corset when you first tried it on. 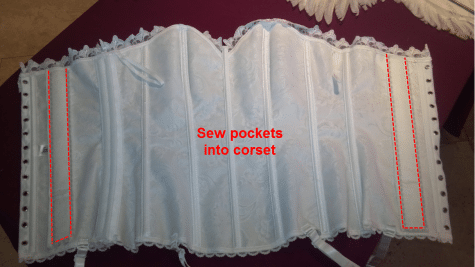 Place the THINNER side of each pocket down against the corset and the THICKER side of each pocket facing up and away from the corset, so that your skin will come into contact with the thicker side while wearing the corset. 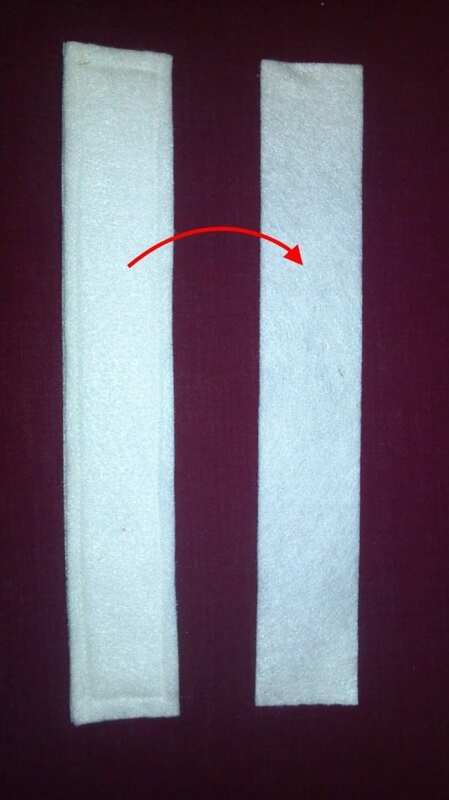 Sew each pocket into place. And here is the finished product! It’s easier to first put on your corset and then have someone help you attach the wings. 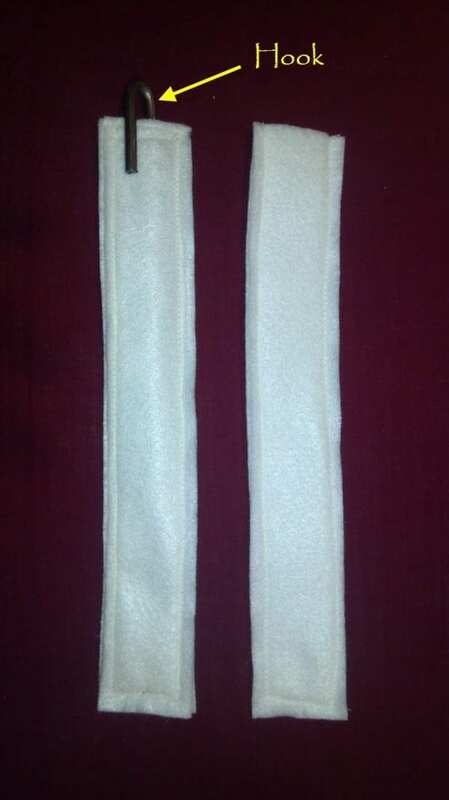 The excess part of the wing strap can either be cut off or just tuck it into your corset when you have it on. Cheap Easy DIY Professional Fog Chiller! wow corsets are not just fun to look at you can hang stuff on them as well. I would like to say that you are F’in awesome!!!! I have been trying to figure out how to make my wings and attach them without ruining my corset. Your plan is genius!!! Thank you SO much for sharing. Where could I find a corset like that one for a little bit cheaper? You see I’m a Cosplayer and I loved your way of attatching the wings to the corset but I just realized my corset isn’t going to work for what I’m trying to do. 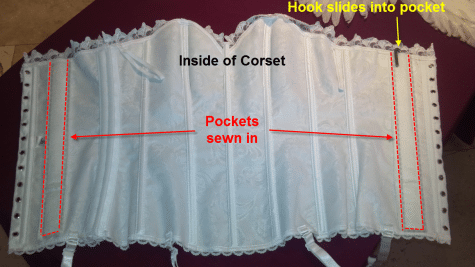 Do you have any suggestions on where I can purchase a similar corset to yours for cheaper by any chance? If you don’t that’s fine, I’m just wondering. Thanks for the wonderful instructions! I found a white corset at a thrift store for 15.00! I work for a dental team and teach kids as a tooth-fairy. My wings flop around and the kids are always pointing out my straps. So attaching them to a corset is a great idea for securing them and fooling those smarty little ones. AWWWW!! What a cool thing to do for the kids!!! I wish the tooth fairy had visited me at the dentist when I was a kid 🙂 I’m so glad you liked the tutorial!